10) To make rice Puddings in Skinnes. Take a pound of rice & boyle it in milk 10 or 11 eggs beate them well, currants halfe a pound [?] nutmeggs half quarteron of an ounce of Sinamon the crumbles of 2 or 3 loafes grated, 3 quarters of a pound of Sugar as much marrow as you think fitt or beef suit minced very small put in a Little Salt Boyle as much Creame as you think think fitt with Some mace in it. Let it be cold and mixt it all together and so fill your skinnes To make an Apple pudding. 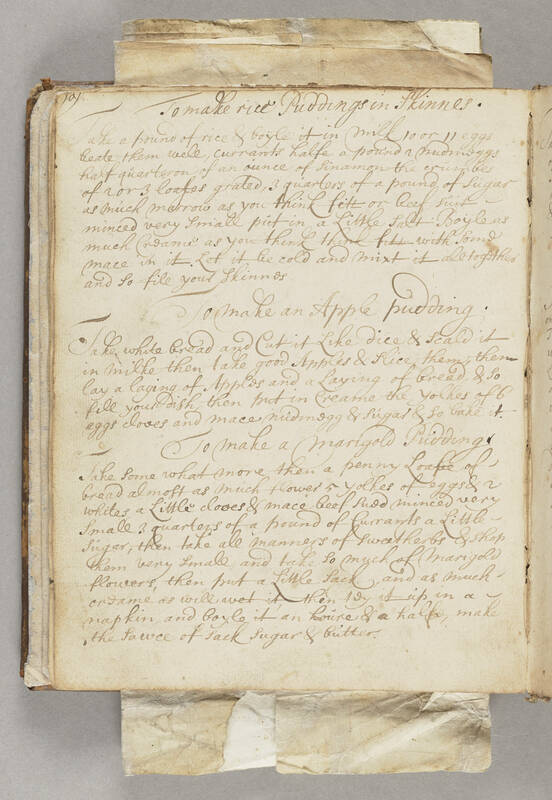 Take white bread and Cut it Like dice & scald it in milke then take good Apples & slice them, then lay a laying of Apples and a Laying of bread, & so fill your dish, then put in Creame the yolkes of 6 eggs cloves and mace nutmegg & Sugar & so bake it. To make a marigold Pudding. Take some what more then a penny Loafe of bread almost as much flower 5 yolkes of eggs & 2 whites, a Little cloves & mace beef suet minced very Small 3 quarters of a pound of Currants a Little Sugar, then take all manners of sweet herbs & shop them very small, and take so much of Marigold flowers, then put a Little Sack, and as much creame as will wet it, then tey it up in a napkin, and boyle it an houre & a halfe, make the Sauce of sack Sugar & butter.